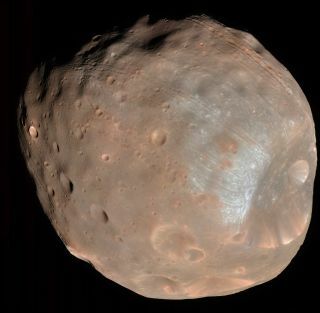 Billions of years ago, Mars suffered from numerous big impacts, and the resulting backwash ultimately scarred the surface of Phobos, one of the Red Planet's two tiny moons, researchers say. In 1976, images from NASA's Viking orbiter revealed that the surface of Phobos is covered in numerous parallel, channel-like grooves. Over the years, researchers have come up with many hypotheses to explain the odd features, but the origin of the satellite's grooves are still heavily debated today. Using new data and images from the European Space Agency's Mars Express orbiter, the scientists also mapped the grooves in much greater detail than ever before, and calculated that the amount of Mars material needed to form all of Phobos' grooves is about two orders of magnitude lower than the total ejecta from Mars' craters. "Everything fits in with this hypothesis," said John Murray, a planetary scientist at Open University in the U.K., and lead author of the new study, which was published in April in the journal Planetary and Space Science. "We can even trace the ejecta that produced the grooves back to [source areas] on Mars." Most scientists think Phobos and Deimos, Mars' two minuscule moons, are former asteroids captured by the Red Planet's gravity long ago. Phobos is 14 miles (22 kilometers) wide, while Deimos has a diameter of just 7.7 miles (12.4 km). The 3-billion-year-old grooves on Phoboscan be divided into different "families," with each groove plane running parallel to the other grooves within the same family, Murray told Space.com. The widths of the grooves vary greatly, from 76 feet (23 meters) to 1,558 feet (475 m). Similarly, they come in a large range of lengths — at least one groove stretches for 18.5 miles (30 km) without any breaks, while others are only a little more than 1 mile (1.6 km) long. Some scientists have previously speculated that the grooves are fractures resulting from tidal forces, the impact that created Phobos' prominent Stickney Crater or other sources. Other hypotheses posit that the grooves on Phobos are the result of local impacts. According to one idea, the meteor that created Stickney Crater kicked up ejecta that showered Phobos, creating the grooves; a related hypothesis proposes that rolling boulders from the crater scarred Phobos. Or, the grooves may have developed when Phobos was hammered by orbiting debris, according to some researchers. But none of these ideas can explain all of the observed characteristics and patterns of the grooves, Murray said. Murray and his colleague Douglas Heggie of the University of Edinburgh believe that Phobos' grooves formed in the distant past when space rocks struck Mars. The impacts ejected jets of liquefied material, which quickly broke up into droplets. The droplets froze in space and became solid particles before striking the surface of Phobos, the idea goes. "I suppose it's like firing a machine gun at a moving target," Murray said. According to the hypothesis, ejecta from one jet traced out a chain of impact craters (a groove) on the surface of Phobos. Other strings of ejecta from the same impact then traced out other chains that are virtually parallel to each other, creating a family of grooves. Murray and Heggie calculate that only about 10 large impacts on Mars would have been enough to create all of the groove families on Phobos. When Murrary first proposed this hypothesis about 20 years ago, it didn't receive much attention. "It just took its place with the other seven or eight major ideas out there at the time," he said. But new images from Mars Expressallowed Murray and Heggie to map virtually the entire surface of Phobos in high detail, and take a close look at the grooves' features. With the new data and models, the researchers argue that this hypothesis can explain all of the grooves' morphological characteristics, unlike other hypotheses. What's more, the pair was able to pinpoint launch latitudes on Mars from which the groove-forming ejecta could have come. Murray is now working to determine specific source craters on Mars. But not everyone agrees that the hypothesis advanced by Murray and Heggie makes sense. Last year, Kenneth Ramsley and James Head, researchers at Brown University in Providence, Rhode Island, tested the hypothesis and found it wanting for numerous reasons. For example, they argue that if the grooves were produced by Mars ejecta, then the so-called zone of avoidance — the region of Phobos where grooves are absent — shouldn't exist, because it's an area where Mars ejecta could actually strike, according to their calculations. In the new study, Murray and Heggie refute each of the points made by Ramsley and Head. On the issue of the avoidance zone, they claim that even though Mars ejecta with high velocities could probably impact the region, there's only a very low chance that there would be a sufficient amount of material to produce grooves there. However, even with the new data and arguments, Ramsley and Head still think Murray's hypothesis is implausible. "Although the Murray hypothesis is notionally appealing, in fact the required precision and complexity is essentially identical to painting a bar code on a golf ball from across the length of a typical classroom using a hand-held ink jet cartridge," they wrote in an email to Space.com. It's more likely, they said, that there is no single explanation for Phobos' grooves. "Our modeling of ejecta from impacts on Phobos suggests that grooves may instead be produced in more than one process," they said.